After the first two Minicircle Conferences in 2007 and 2008, the Minicircle and DNA Vector technology has evolved considerably. This was clearly demonstrated at the conference now taking place. 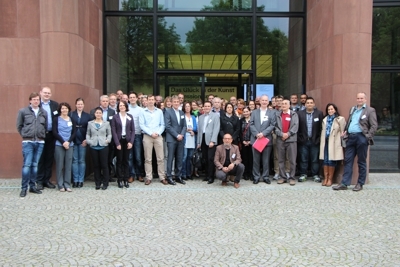 More than 60 participants enjoyed the very fruitful and stimulating meeting. The 3rd Minicircle & DNA Vector Conference served as a meeting ground for scientists working in different fields of research. Various leading scientists from all over Europe reported on their current research projects and results. “We wanted to specifically invite young scientists to present their research and give them the possibility to learn more about the latest developments in the Minicircle technology and its applications in DNA vaccination and gene therapy.” said Dr. Martin Schleef – CEO of PlasmidFactory (www.plasmidfactory.com) and scientific organizer of the conference. In the unique atmosphere of the Kunsthalle Bielefeld the conference found a perfect frame between Expressionist artwork, e.g. of Hermann Stenner, a remarkable young painter from Bielefeld, who fell already in 1914 at the age of only 23 years in 1st World War. Please read the complete press release here.